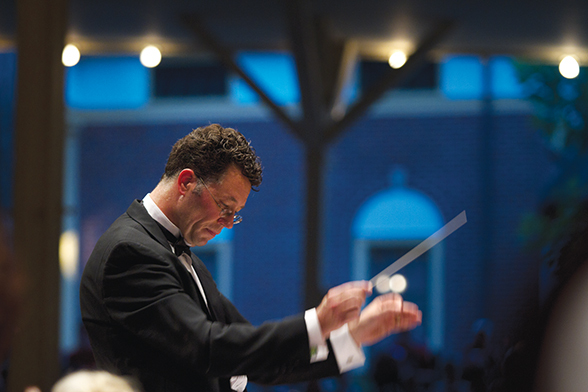 Steven Osgood conducts the Chautauqua Symphony Orchestra. Chautauqua Institution officials announced today Steven Osgood will succeed Jay Lesenger as artistic and general director of the Chautauqua Opera Company. This decision follows Lesenger’s April announcement that he would be leaving the Institution after 21 years on the job. An extensive search process ensued that involved interviews and visits to the grounds. Ultimately, the 50-plus applicants were narrowed to two finalists. From these finalists, and based on a search committee’s recommendation, incoming Vice President for the Performing and Visual Arts Deborah Sunya Moore offered Osgood a three-year contract with the company. He accepted. Osgood comes to Chautauqua with five guest appearances already under his belt, most notably as conductor for the 2009 Chautauqua Opera production of Tosca and last season’s The Ballad of Baby Doe. He is also an active guest conductor nationally, working with notable companies such as The Metropolitan Opera, Santa Fe Opera and Atlanta Opera. “This is someone who comes to us as a national figure of great import in the opera world, but also as someone who is a Chautauquan,” said Moore, who currently serves as associate director of programming. Osgood echoed that sentiment, and said he looks forward to bringing his wife and two sons, now 7 and 11 years old, to enjoy the grounds each summer. He said the community aspect of Chautauqua is what drew him to the position, especially considering the emphasis on fine arts. The details for next season are still undecided. Osgood said his two priorities include bringing diverse talent and concepts to Chautauqua and raising the profile of opera on the grounds. Effectively, this means different approaches to the art executed in unique venues. Moore, who will succeed Marty Merkley on Oct. 1, said Osgood’s proposed initiatives fit into a concerted effort to raise the profile of all arts programs on the grounds. While Osgood formally assumes his role Sept. 1, planning for the next season begins immediately with key opera staff and advisers, Moore said. Because the Institution generally does not make programming decisions more than a year in advance, Osgood said he is excited to implement his own vision for the company as soon as next summer. Lesenger, will remain available to Chautauqua through the end of the year to ensure a smooth transition. Both Moore and Osgood hope to announce next season’s productions by early fall.